Aliens will be glad to know that if ever they need to findan apartment here on Earth, someone has got them covered. On March 11th at 6:30pm, a company called DeepSpace Communications Network beamed the first commercial transmission of awebsite into space. The message?Over one hundred thousand separate postings from craigslist.com, the popularcommunity website that includes classified listings for jobs, housing and othergoods. The transmission included a date and time stamp, as well as an audiotrack identifying the message as originating from Earth. "It's very fittingthat the first [commercial] transmission into space is by a community websitelike craiglist because it represents a wide crosssection of society," said Jim Lewis, vice president of Deep SpaceCommunications Network. The company is an offshoot of Communications Concepts, Inc.,a company based in Cape Canaveral, Florida, that produces livetelevision coverage of shuttle launches. That same equipment is now being usedto give the public a chance to send messages out to any intergalactic neighborsthat might be listening in a service slated to become widely available withinthe next month. Lewis told SPACE.comthat the company is currently in talks with craigslistto broadcast another transmission on to coincide with the planned Discoverylaunch, NASA's first post-Columbia shuttle mission. Commercial messages have long been transmitted into space, inadvertantly sincethe first radio and television signals were generated, but the Deep SpaceCommunications Network joins a short list of intentional transmissions aimed atcontacting someone--anyone--out in the Universe. 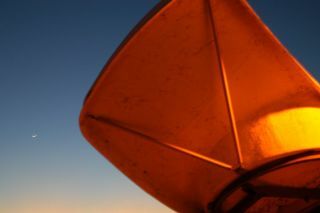 Another company, talktoaliens.com, offers a similar servicebut with an added twist: users can send a text message or they can dial a phonenumber and have their voices beamed live into space via a custom designedparabolic dish antenna dubbed the "Intergalactic Transmitter". Theservice has been available since March 7th, and the antenna isoperational 24-hours a day. Talktoaliens.com is operated by a small group of radio andbroadcasts engineers who were part of the Civilian Space eXplorationTeam, or CSXT, a group that made news in May of last year when theysuccessfully launched the first amateur rocket into space. The company isheaded by Eric Knight, CSXT's former avionicsmanager. Neither of the companies target specific stars or particularpoints in space for their transmissions. Deep Space Communications Network aimstheir antenna at coordinates where there are no known satellites, and they estimatethat their transmissions will travel approximately 1-3 light years.Talktoaliens.com states that their antenna is designed to sweep through as muchof the Milky Way Galaxy as possible. The two services are the latest in a long tradition of radioCETI--or Communications with ExtraTerrestrialIntelligence--attempts. The first, known as the AreciboMessage, occurred in 1974 when two Cornell University scientists beamed anencoded radio message that included an image of a human figure and thestructure of DNA toward the great globular cluster M13, 25,000 light yearsaway. In 1999 and 2003, a more elaborate set of messages knowncollectively as the Cosmic Call was sent out from a radio telescope in the Ukraine tonearby star systems deemed likely to harbor life. In 2001, another message,composed by Russian teens and called the Teenage Message to the Stars, was alsotransmitted from the Ukraineradio telescope. Knight describes his company as a public service. "The goalis to give every citizen on planet earth who has access to phone or computer anequal opportunity to use this service," he said. "If you leave it to onlya select few, it will end up being some sort of elite processed message." Knight admits that the chances of an alien response are slimbut said that it would be the ultimate reward. "It's the reason so manypeople are listening or talking into space and trying to establish dialoguewith alien races."